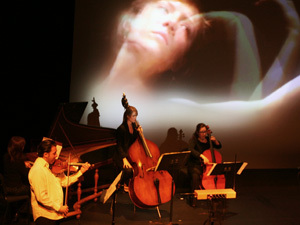 To celebrate both the 10th anniversary of the Beyond the Machine festival and the opening of the new Rosemary and Meredith Willson Theater—a black-box space constructed with the Music Technology Center in mind—Juilliard and the center will be hosting two programs in the Willson Theater in March, each presented on four consecutive nights. The first program, “InterArts,” runs March 17-20, and the second, “Juilliard Plugged In,” runs March 25-28. All the works to be performed were composed by alumni or will feature alumni performances on opening night. The ambitious “InterArts” program is comprised of significant, multidisciplinary collaborations, featuring music, movement, lighting design, projection design, and/or film. Music Technology students performed at the dedication of the Rosemary and Meredith Willson Theater on October 6, 2009. It’s an important season for the Music Technology Center at Juilliard, which has quietly added significant opportunities to the Juilliard curriculum since 1999. Composer Edward Bilous, chair of the Literature and Materials of Music department, founded the center and developed three goals for the facilities and courses offered: provide opportunities for like-minded artists to collaborate on new multidisciplinary or multimedia art; support students interested in using technology to create new works; and teach skills needed to compose for film and to work in recording studios. “We want to give students experience and open them to whole new avenues of artistic expression, in order to build fruitful careers,” Bilous explained in a recent interview. The new Juilliard Music Technology Center has plenty of tools to do that. It features a state-of-the-art recording studio and a highly-stocked technology “playroom.” All students enrolled in music technology classes at Juilliard have access to this new equipment, so there’s terrific potential for current students to collaborate on new works and to incorporate these tools in their future careers. A number of former Juilliard students have done exactly that, including students outside the Music Division. Dance alumna Andrea Miller is a choreographer who has used her experience with the center to develop innovative, multimedia works. She is collaborating with the composer group Blind Ear Music to create a highly interactive piece for the festival’s “InterArts” program. In it, short repeating loops underlie every element: musical loops correspond to video loops and to individualized movement loops expressed by the dancers. Even the stage lights respond to the sound levels of the music. Blind Ear Music founders Jakub Ciupinski and Cristina Spinei began working together when Bilous suggested they collaborate in some way. Since graduating from Juilliard, their work on Blind Ear Music has led to an entirely new approach to performance and composition, which they call “real-time composing.” Using Ciupinski’s software, performers repeat loops that are notated on individual computers and changed in real-time by the composer at the master computer. In this way, the composer can shape a composition even as the musicians play it. Juilliard music performance majors have incorporated their student experiences in the Music Technology Center into their careers as well. Members of the innovative string quartet Ethel began their investigations into electro-acoustic music while they were students at Juilliard. One of the violinists, Cornelius Dufallo, is presenting two movements from a 2008 piece, Suite for Electric Violin, on the “Plugged In” program. He uses a combination of live sound manipulation and samples, and he is collaborating with lighting designer Paul Hudson to create a lighting scheme for the piece. Dufallo’s experiences with technology while he was a student heavily influenced his decision to pursue a career in contemporary music. From his perspective, the use of technology in his own music making was entirely logical. “We must remember that our violin, our pianos, our oboes—these are all finely developed pieces of technology,” he said. “Adding modern technology to our instruments is in no way ‘outside’ of the classical tradition—it is simply a broadening of possibilities.” Juilliard faculty member Mari Kimura, who is composer-in-residence at IRCAM, the European institute for music and sound research, also extends the possibilities of the violin. She uses a system that tracks the gestures of her violin bow, allowing her to create and manipulate a world of sound beyond the violin. Another alumna composer and now Juilliard faculty member, Michelle DiBucci, is presenting a reconstruction of Karlheinz Stockhausen’s infamous Helikopter-Streichquartett, originally conceived for string quartet and four flying helicopters. Stockhausen placed each member of the string quartet in a separate helicopter, transmitting the audio and video of the musicians to the concert hall. In the Beyond the Machine presentation of the piece, on the “InterArts” concert, DiBucci will create the illusion through video projection and audio mixing that the musicians are flying elsewhere during the performance, though they will actually be nearby the theater, performing in sync through the use of a click track in their headphones.